It's a daily struggle to feed the shelter animals. Help us by buying one of food bundles or buy directly through one of our supported pet food suppliers. Food is a basic necessity for shelters. To save on costs, often the cheapest food is brought for the animals. Unfortunately cheaper foods tend to have limited nutritional value, are full of fillers and contain food that dogs and cats shouldn't eat. A common problem for long term shelter dogs is kidney failure, diabetes and other diet related illnesses due to a cheap, bad diet. Once a dog gets this sick, it's expensive to maintain their well being. 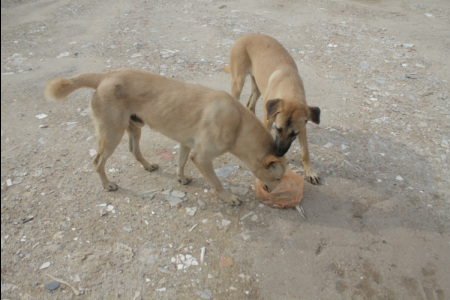 Good food is essential to helping our shelter and street animals keep healthy. Healthy animals can cope better within the shelter environment and cope with shelter-related stresses. We have created food bundles that consist of kibble and canned food. You can also buy through our supported Pet Stores. Our shelter partners have many seniors and medically ill pets who need specialist food. Spending money now on healthy food will help save on expensive medicals bills in the future. Beary is offering attractive dog food items as donations to CAS.